Found 3 file extension associations related to Myst 10th Anniversary Collection and 2 file formats developed specifically for use with Myst 10th Anniversary Collection. This collector's edition includes Myst Masterpiece, Riven, and Myst III: Exile, re-engineered to be fully XP compatible. 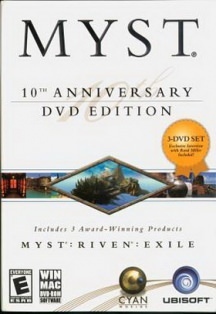 This is the first Myst compilation available on DVD format. Immerse yourself in the stunning beauty of the Myst adventures. Explore numerous Ages, follow dramatic storylines, and solve mind-bending puzzles. Celebrate the 10th anniversary of this unstoppable brand! Product includes an exclusive 10th interview with Rand Miller, as well as footage from the making of Myst III: Exile and Riven. Myst Masterpiece: In this acclaimed first adventure, join Atrus as you discover the secrets of the D'ni civilization. Remastered to include an electronic hint guide. Riven: Sequel to Myst: Immerse yourself even deeper in a world cursed by bewildering rifts in time. If you need more information please contact the developers of Myst 10th Anniversary Collection (Ubisoft Entertainment S.A.), or check out their product website.